Surveys repeatedly show that professional chefs prefer gas over electric stoves by an eye-opening margin: well over 90%. 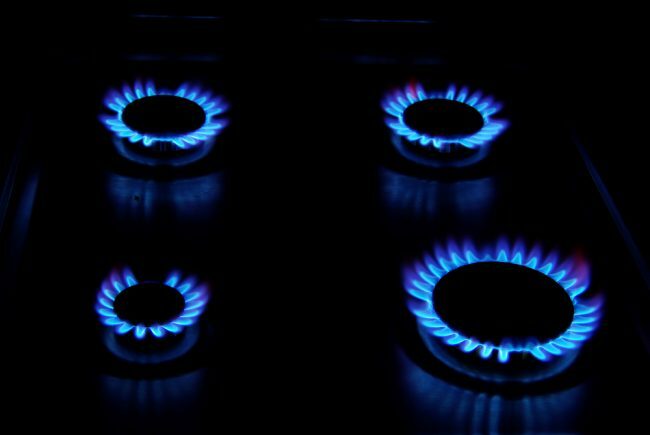 In fact, in one Florida survey 98% of chefs chose gas as the energy source they prefer to cook with, because of consistent and even control of heat, faster cooking times, and better results – bring on the best gas range review. Take your time and read the gas range buying guide information just below. Alternatively, skip ahead by clicking on the following link, to see which models made it onto the best gas range top 5 list. The vote isn’t quite as overwhelming when it comes to ovens, but around two-thirds of chefs say they prefer gas ovens as well. Induction cooktops have muddled the picture somewhat, but gas remains the choice of professionals. For consumers, other factors come into play; gas ranges are usually a little more expensive to buy but less expensive to operate, some areas don’t have natural gas lines – and many people have a strong preference for the type of stove they grew up with. Today’s best sellers are smooth-top electric ranges, but not by a wide margin. Many factors played into our choice of the top 5 best gas range reviews. For cooktops, the Groom+Style review team looked at the heat produced by the stove’s burners, whether the ranges had high-performance burners, bonus burners, grills or griddles, and the type of grates they had (and how easy they were to clean). Self-cleaning, convection and dual ovens were considerations, as were the functionality and ease of operation of control panels. What Groom+Style looked at most, though, were the manufacturing quality of the ranges and the “yum” factor – the food they produced. After all, a range is going to be in your kitchen for at least ten years, perhaps many more; even if it’s a budget model, you’re not going to be changing it out every few years. It has to stand up to the wear it will experience over at least a decade of cooking. The “yum” factor, of course, is the obvious one. Ranges will often perform better when cooking than baking (or the other way around) so we searched for models which wouldn’t disappoint in either important function. What is the Standard Width for a Home Kitchen Range? The two standard widths for home kitchen ranges are 30” and 36” wide, with the 30” models far more popular. For that reason, Groom+Style have concentrated on the smaller ranges you’re likely to be shopping for. In almost all cases, 36” stoves have additional features but are also a lot more expensive. Let’s tuck in and review Groom+Style’s list of the Top 5 Best Gas Ranges for Nov. 2016. Samsung NX58H9500WS Gas Range. Click on the photo to check the Price on Amazon. Those who want a gas range to make Kraft Mac and Cheese and frozen pizzas should skip to our next review, as this expensive stove might be just a bit more than they need. 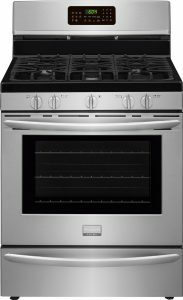 For those who love to cook and don’t want to be hamstrung by an ordinary cooktop or oven, though, this Samsung beauty is the best 30” gas range you can find. First things first; this is a beautiful appliance with a gleaming stainless steel finish and attractive, continuous black cast-iron grates easily removed for cleaning. It will add a professional or European look to any kitchen and even though it is a slide-in model, it will look just as good used free-standing. With that out of the way, we’ll start with the cooktop. The Samsung has four regular burners; there are two 5,000 BTU simmer burners), a powerful 16,000 BTU one, and a “dual power” burner with two separate heating elements extending its power from 700 BTU all the way up to 19,000 BTU. There is a custom wok grate for that burner as well. The middle burner can be used as a two-way griddle (the plate is reversible to be smooth or ridged), for fish or for large pots, although the griddle construction does mean those pots will heat slowly. This doesn’t get quite as hot as an electric cooktop, but it’s the best stove on our list and control over the gas flames is excellent. The 5.8 cubic foot oven with three racks (one which glides in and out smoothly) is large and terrific. That’s because it’s a true convection oven which can be used for either convection baking or roasting. Food comes out of this baby just about perfectly cooked when using the convection settings, without the uneven temperatures that are commonly seen with gas ovens and sometimes are an issue when using standard settings on the Samsung. A built-in temperature probe is a great extra, as is the oven warming drawer. It’s self-cleaning, of course. The cooktop has standard controls, but the oven runs on Samsung’s innovative “Guiding Light” system. All of the settings (including unusual presets like “salmon” and “dehydrate”) are selected on the front LED panel according to a step-by-step menu; you’re walked through the control panel from left to right as you make your choices, with the options that don’t match your previous selections “grayed out.” It might seem like a gimmick, but it’s intuitive and very easy to use. As much as professional chefs prefer gas, no gas range is going to be perfect. This one is darned close and tops our list of the top 5 best gas ranges. Welcome back, to those who moved on after seeing the price tag of the Samsung. We’re now entering the more affordable zone with a surprising entry: the Frigidaire FGGF3054TS which outperforms its price tag. This free-standing model is also stainless steel with continuous cast-iron burner grates (although the cooktop itself is black enamel), and while it doesn’t look as cutting-edge as the Samsung and doesn’t have a ton of bells-and-whistles, it’s still attractive. More importantly, it performs as well as many pricier gas ranges. There are five standard sealed burners on this gas range. One is a 5,000 BTU simmer burner, and even though the other four aren’t quite as powerful as the Samsung’s they do range up to 17,000 BTU with a quick-boil setting; they’ll do pretty much anything you need them to without breaking a sweat. The 5.0 cubic foot oven heats up quickly and distributes heat evenly, the two most important qualities of a great oven. If you’re looking for a convection model you should consider one of our other choices, but this standard oven performs extremely well for all baking and broiling tasks. The self-cleaning function works perfectly, too. The control panel is functional with no special features, but works just fine. Our only real objection is that, as on most ranges, it’s positioned on the backsplash behind the burners so you have to reach over hot pots to use it. The Frigidaire is less than half the price of the Samsung, but it’s definitely not half the range. Groom+Style feels it’s the best choice for those who don’t care about griddles, convection ovens and touchscreen controls, but simply want a high-performing gas range. 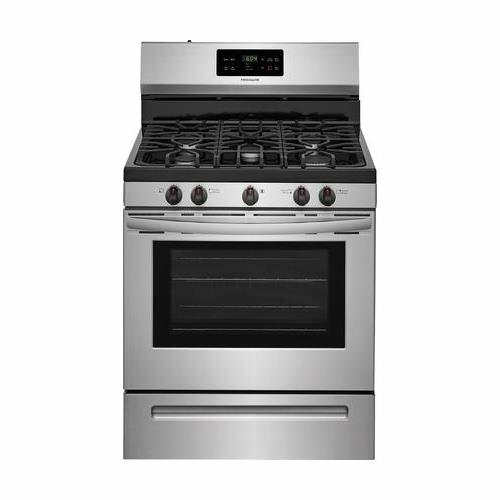 LG LDG4315 Freestanding Double Oven Gas Range. Click on the photo to check the Price on Amazon. Yes, we’re hopping around on price a bit, because this LG model sells for more than the Frigidaire gas range. The reason the G+S review team wanted to include it on our list of the top 5 best gas ranges, though – other than the fact that it’s a solid product that cooks well – is that it has a double oven, a great feature that’s somewhat unusual on reasonably-priced 30” models. The top of this LG range is really good. Its hottest burner can reach 18,500 BTU, it has one warming burner at 5,000 BTU, and there’s a central griddle/extra burner as well. They heat up quickly and control nicely, and the grates are continuous cast iron with a porcelain cooktop underneath. What Groom+Style really liked, though, is the fact that there are dual ovens. 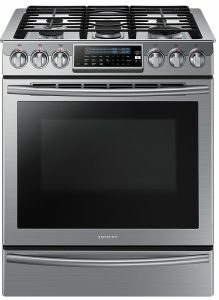 The upper, standard oven is 2.6 cubic feet and works OK for traditional use; the bottom 4.3 cubic foot oven adds convection cooking to the mix (bake, roast, and multi-rack) and utilizes LG’s “ProBake” system which places the heating element at the back of the oven instead of underneath the food. This evens out temperatures somewhat – meaning the bottoms of your cookies and cakes don’t burn as easily as with most gas ovens. The one issue we had is that it’s not a true convection oven, so temperatures still aren’t as even as they could be. The LG LDG4315 has European good looks and performs well, although not spectacularly well. But it’s the best double-oven gas range you can find in this price range. 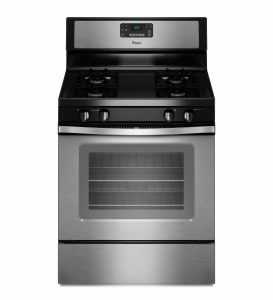 Whirlpool WFG515S0ES Gas Range. Click on the photo to check the Price on Amazon. Our final two products are also the lowest-priced models in our rankings. 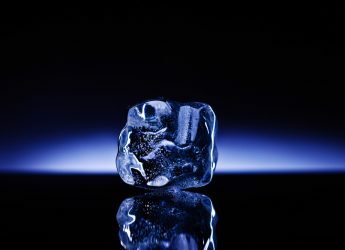 You’ll have to make some concessions in terms of features, but you’ll still be getting well-cooked food and may still have enough money left over to go out for dinner once in a while. 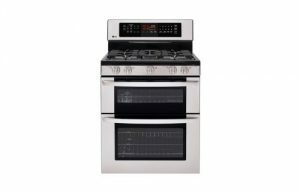 The Whirlpool WFG515S0ES only has four burners, doesn’t have a convection oven and its standard oven is just 5.0 cubic feet. As long as you use the right burners for the right purpose, though, you should be satisfied; the more powerful burners are tough to use on low heat, and while they heat up quickly not all get quite as hot as we’d like. Juggle the pots a little to find the sweet spot, and this range does just fine. The standard oven maintains temperatures surprisingly well and bakes quite nicely for a gas range, even without a convection feature. Pre-heating takes a while, but the proof of the pudding (or more accurately, the roasts and the cakes) is that the food comes out delicious when you’re eating. This Whirlpool has no bells and whistles (except a storage drawer), but it doesn’t have a thousand-dollar price tag, either. It’s a nice gas range for the price. We’ve mentioned that the two standard widths for freestanding gas ranges are 36” and 30”. 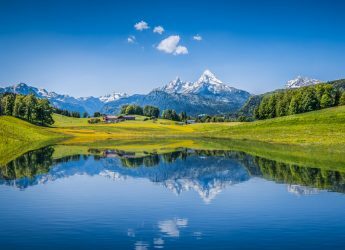 So what can you do if you have a tiny apartment kitchen, or if you need a stove for a smaller area like a second kitchen or vacation cabin? The Groom+Style review team has found a good option: the Avanti GR2013CSS, which is just 20 inches wide. This is a standard-height, four-burner gas range that’s designed to fit perfectly in kitchens where space is at a premium. It also is available, as you might expect, at a lower price than larger models. The four sealed burners on the Avanti are described as rapid, semi-rapid and simmer. In truth, they don’t deliver the strong 10,000+ BTU performance of the cooktops we’ve already discussed, but they range from 2,800 to 8,800 BTU and can get the job done as long as you’re patient. The small oven (2.1 cubic feet, with two racks) can double as a broiler and reach temperatures up to 500°, with an inside light and see-through window. There’s also a storage drawer underneath the oven. There are no bells and whistles like pre-programmed settings, a self-cleaning function or timers with this freestanding range, just standard knob controls. You don’t get cast iron grates above the stainless steel top, just painted steel. However, a propane conversion kit is included with the GR2013CSS, and it might just come in handy if you’re buying this small gas range for that rustic vacation home. You shouldn’t expect the Avanti to perform at the same level as our higher-ranked gas ranges, but it’s a good performer for its price and a great choice if you need it for its size. 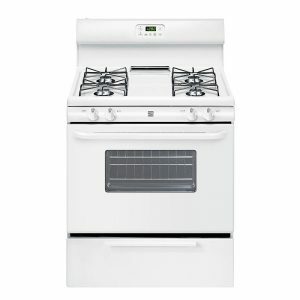 Frigidaire FGGF3058 Gallery Series Gas Range. Click on the photo to check the Price on Amazon. * Unfortunately it looks like this Frigidaire model might not be available right now, so please consider another gas range for now. 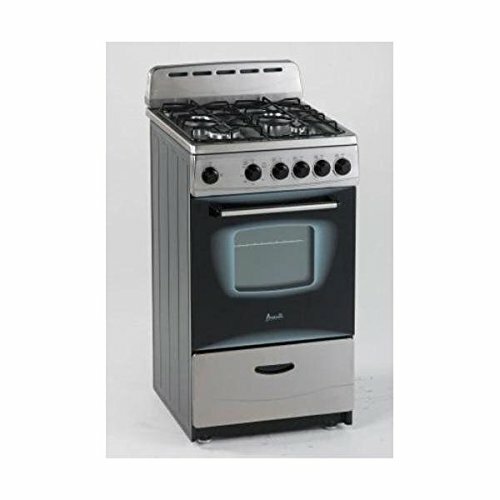 There are four standard sealed burners plus a center “fish” burner/grill on this Gallery Series gas range. One burner is a 5,000 BTU warmer, and even though the other three aren’t quite as powerful as the Samsung’s they do range up to 17,000 BTU. The 5.0 cubic foot oven has standard and true convection modes and heats up quickly, particularly when using the “quick pre-heat” setting. You’ll find that on the Frigidaire the oven’s temperature variations are greater when baking with convection than with standard mode, but food still cooks extremely well for a gas oven. As for the features Groom+Style mentioned, the oven on this Frigidaire range is self-cleaning, there’s a warm mode, a temperature probe, and a slide-out rack. 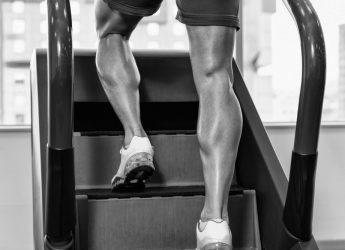 But one innovative addition is the “half-rack” inside the oven, which essentially gives you more space by letting you position two small dishes on one side of the oven (like potatoes and vegetables) while cooking a large one (like a turkey) next to it. The control panel is an LED touchpad which has all the essentials but only one pre-set (for pizza) – our only real objection is that, as on most ranges, it’s positioned on the backsplash behind the burners so you have to reach over hot pots to use it. The Frigidaire is a very good range for its price. The Groom+Style review team has this Kenmore on our list of the top 5 best gas ranges not because of outstanding performance, but because it provides good performance at a bargain-basement price. There are four burners with individual steel grates; all four are 9,000 BTU burners and not designed for speed cooking or simmering, just for cooking. The 4.2 cubic foot standard oven has enough room for most meals you’ll be preparing, and there’s a broiler drawer underneath it. The control panel only lets you set the function (bake or broil) and the timer, but it works. In a nutshell, this isn’t a lot of oven – but it’s probably quite similar to the one you grew up with. It’s reliable, it cooks without a problem, and it’s the best cheap gas range available. The Groom+Style review team hopes you found this review helpful – while you are replacing your gas range why not consider buying some new top of the range Kitchen Faucets.